Summary: A new device for the endovascular treatment of aneurysms is described. It consists of a guidewire-directed porous liner or bag, detachably mounted on a microcatheter and designed to be inserted into an aneurysm and to be filled with detachable coils or other embolic agents. Several prototypes have been made. Preliminary in vitro and in vivo experiments have demonstrated its behavior in relatively wide-necked aneurysms. Since the introduction of controlled detachment coils, such as the Guglielmi detachable coil (GDC, Target Therapeutics, Fremont, CA) (1, 2), increasing numbers of patients with ruptured and unruptured intracranial aneurysms are being treated (3–5). Initial results have been so encouraging that a prospective multicenter trial randomizing patients with surgically accessible aneurysms is now under way (the International Subarachnoid Aneurysm Trial). There are, however, recognized complications in the use of detachable coils, including thromboembolism, inadvertent occlusion of the aneurysm-bearing artery, and early and delayed rupture of coil-treated aneurysms (5, 6). Some of these problems are due to the tendency of coils to prolapse out of wide-necked aneurysms and the absence of evidence, in humans, of endothelialization across the necks of coil-treated aneurysms (7). Absence of endothelialization has also been reported in a coil-treated rabbit aneurysm model (8). Indeed, in this model, large open spaces without signs of thrombosis were found between the loops of the coil baskets in several aneurysms regardless of the observation period. In aneurysm models in pigs (7), dogs (9), and primates (10), however, endothelialization across the necks of coil-treated aneurysms has been observed. In order to address these shortcomings, one of us (MAJ) conceived the idea of lining the aneurysm wall with a thin membrane before coil insertion. His hypothesis was that this would strengthen the envelope of the aneurysm and give some early protection against the pressure of coils on the aneurysm wall. If highly porous, it might also provide a scaffolding for the ingrowth of fibroblasts, in time greatly strengthening the aneurysm, and for endothelial cell growth across the aneurysm neck. It would also tend to contain the coils within the aneurysm, preventing herniation of coils into the parent artery. We describe the design of a prototype aneurysm liner and our preliminary experience with the device in experimental aneurysm models. 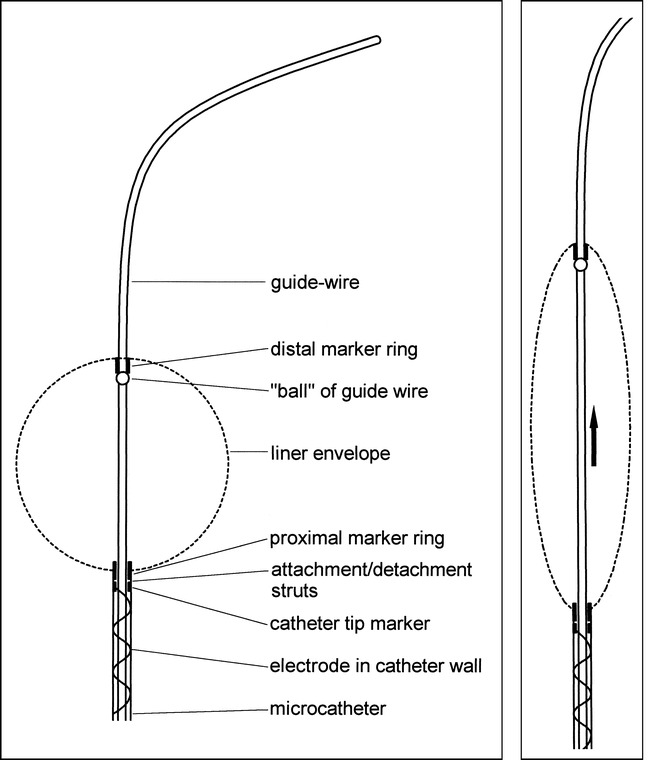 The design of the liner, catheter, and guidewire combination is shown diagrammatically in Figure 1. The aneurysm liner consists of an approximately spherical bag of knitted fabric of 100μ thickness (5-denier nylon, polyurethane fiber mixture). It is detachably mounted on the tip of a delivery microcatheter, and has proximal and distal platinum marker rings. The proximal ring is used to attach the liner onto the catheter; the distal ring is of smaller diameter. The catheter and liner combination is designed to allow the passage of the tip of a 0.014-inch–diameter Stealth valve wire (Target Therapeutics) through the catheter and liner and out through its distal ring. The diameter of the distal ring is such that it allows the passage of only the terminal 2 cm of a stealth valve wire and not the 0.020-inch–diameter “ball” of the wire (Figs 1A and B). By advancing the wire in the catheter, therefore, the ball engages with the distal marker ring, thus stretching the liner into a long, narrow configuration to facilitate navigation through arteries and insertion into the aneurysm. Once the liner is positioned in the aneurysm, the valve wire can be withdrawn and the liner filled with coils. The liner is designed to remain attached to the delivery catheter until filled with coils, after which it is detached and the catheter removed. Line diagrams of the liner, catheter, and guidewire combination. A, The liner is a bag of highly porous, strong, stretchy fabric detachably mounted on the tip of a microcatheter. It has proximal and distal marker rings, allowing the passage of a guidewire. The catheter has an electrical contact close to its hub and a conducting wire incorporated into its braiding. The proximal marker ring is attached to the catheter tip marker ring by two thin stainless steel struts. It is detached by electrolysis of these struts. B, The “ball” of the guidewire is too large to pass through the distal marker ring. When the guidewire is advanced in the catheter, the ball engages with the distal ring and stretches the liner into a long, thin configuration to facilitate endovascular navigation. Several prototype catheter/liner combinations have been made. 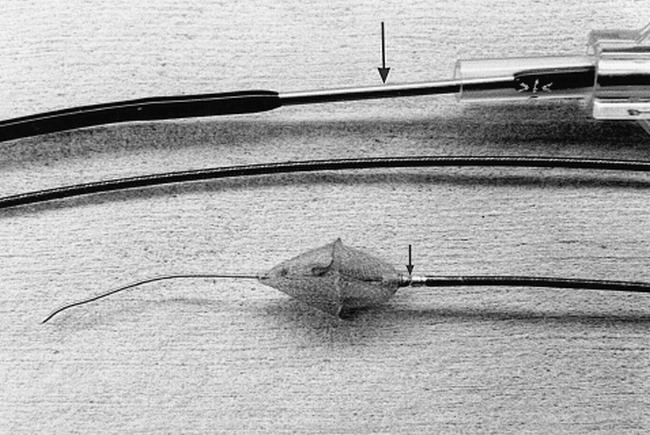 In most of these, the liner was connected to the catheter by a friction attachment, designed to be released by traction on the delivery catheter while advancing the guide catheter. Target Therapeutics, however, has produced one prototype detachable-tip catheter, and a liner was successfully mounted on it (Fig 2). This is a modified TurboTracker 18 catheter, which incorporates an electrode in its braiding. The detachable tip is designed to be released by electrolysis in much the same way as a GDC is released from its pusher wire (1). The device was deployed in an arterial model consisting of polyethylene tubing in which saline circulated. A side-wall aneurysm model was constructed out of Perspex and linked to the tubing. The aneurysm was 8 mm in diameter with a 7-mm–diameter neck and was designed to test techniques for preventing coil prolapse into the parent artery, such as the remodeling technique of Moret et al (11). The liner was inserted through an 8F guide catheter and navigated into the aneurysm. It was then filled with three GDCs (Fig 3). After detachment of the last coil, the liner was detached from the delivery catheter. The liner and its contained coils were then retrieved (Fig 4). In vitro experiment. The liner has been deployed in a model wide-necked side-wall aneurysm and filled with three GDCs. The liner has retained the coils in the neck. It remains attached to its delivery catheter. fig 4. The liner, containing three coils, was retrieved from the in vitro aneurysm model. The first few millimeters of the first coil have penetrated the liner but the remaining coils are contained. The distal marker ring of the liner is visible as a dark dot in the upper third of the specimen. Using the technique previously described (12), a side-wall aneurysm was constructed from a vein allograft on the carotid artery of a pig. The aneurysm sac measured 8 mm in transverse diameter, 13 mm in length, with a 5-mm–diameter neck. A 10-mm–diameter liner was inserted into the aneurysm by the transfemoral route and filled with a single GDC with a primary diameter of 0.018 inches, with a complex shape of 12-mm secondary diameter and a length of 30 cm. The coil was fully inserted and detached. The liner was then detached from the delivery catheter in the same manner as in the in vitro experiment. Follow-up angiography was performed 3 weeks later, before sacrifice and postmortem examination. Using standard histologic methods, the aneurysm was embedded in paraffin and stained with hematoxylin-eosin, Masson trichrome, and elastic van Gieson. Apart from the penetration of the first few millimeters of the first coil, the liner acted to retain the coils inside the lumen of the aneurysm model and prevented them from prolapsing into the parent vessel without the use of a restraining balloon (11). The liner was undersized relative to the aneurysm but it contained the whole of the coil, which showed no tendency to herniate out of the aneurysm neck. The aneurysm was completely occluded by the liner and one GDC. Follow-up angiography showed complete occlusion of the aneurysm with preservation of the parent artery (Fig 5). Angiogram shows the appearance of the side-wall venous-pouch aneurysm in a pig 21 days after embolization with a liner and one GDC. The appearances are consistent with complete obliteration of the aneurysm with healing of the neck. The distal marker ring of the liner can be seen as a dot to the left of the coil mass. A, The carotid artery has been opened to show the healed neck of the aneurysm represented by a small dimple (arrow). B, The aneurysm has been sectioned longitudinally to show peripheral granulation tissue (arrow) and central unresolved blood clot within the interstices of the GDC. The liner material cannot be seen in the gross specimen. Macroscopic examination showed complete occlusion of the aneurysm and healing of the parent artery wall at the aneurysm neck (Fig 6A and B). Microscopic examination of a section through the aneurysm showed the presence of a linear pattern of small fibrils in different orientations around the periphery of the aneurysm fundus that marked the location of the aneurysm liner. Enclosed within the liner were larger and more irregular tissue defects that marked the location of the endovascular coils that had been removed before histologic processing. There was a marked granulation tissue reaction extending inward from the periphery of the aneurysm, involving the wall of the fundus and extending through the interstices of the aneurysm liner and beginning to surround the loops of the endovascular coils. There was also a marked vascular reaction with neovascularization extending into the fundus of the aneurysm and through the aneurysm liner and surrounding the endovascular coils. The center of the aneurysm still contained unresolved blood clot. A cellular plug had obliterated the neck of the aneurysm, with some identifiable collagen deposition within the intercellular ground substance. At the margins of the plug, where it met the arterial wall, endothelial cells were visible extending over the luminal surface of the plug. To our knowledge, this concept of endovascular occlusion of arterial aneurysms has not previously been described. 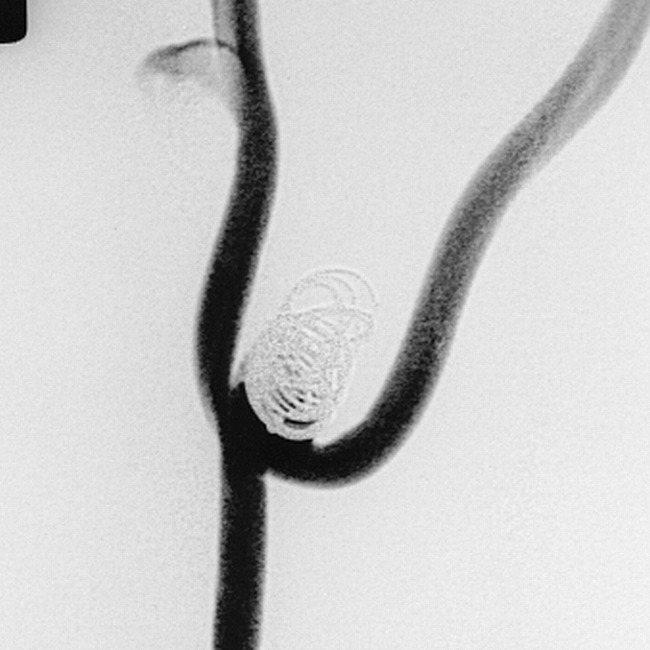 Balloons have been used in the endovascular occlusion of aneurysms and the technique has been superseded by coil occlusion because of the high morbidity and mortality associated with their use (13). The aneurysm liner has the superficial appearance of a balloon, but there are significant differences. Unlike a balloon, the liner is made of highly porous material, allowing the free passage of the liquid and cellular elements of blood across its membrane. High hydraulic pressures cannot therefore build up in the liner, a possible cause of rupture when balloons are used to treat aneurysms. It is designed to be distended by coils, although other embolic materials could be used. Although we have not measured the distension forces on the aneurysm sac during coil placement, when a liner is used, they are unlikely to exceed, and are more likely to be less than, those of unrestrained coils, because of the plastic recoil of the liner material. The material will allow cellular activity on either side of its membrane, thus enabling fusion with and strengthening of biological tissues not permitted by balloons. There was clear evidence that the vascular granulation tissue was able to penetrate the detachable aneurysm liner and would have been expected, in time, to have resulted in complete fibrous obliteration of the aneurysm fundus. The material has also been chosen to be soft and distensible. If modestly over-sized with respect to the aneurysm, it is likely that the liner will conform to the aneurysm shape to almost the same degree as an unrestrained coil mass. Finally, the liner is guidewire-directed and electrolytically detachable. Balloons are not generally guidewire-directed and most have a friction attachment to their delivery catheter. Several advantages and disadvantages of the device can be predicted or have been demonstrated relative to the use of coils alone. Originally, the liner concept was conceived as a possible way of reducing the frequency of early or delayed aneurysm rupture. Once inserted into the aneurysm, it would seem theoretically only to have advantages. Aneurysm walls can be very thin (14), and their exact thickness is not apparent to the endovascular operator. The liner would tend to contain the coil mass and may reduce the risk of aneurysm wall penetration. It also has the effect of containing the coils at the neck of the aneurysm, preventing them from prolapsing out. It may, therefore, extend the use of coil occlusion to wider-necked aneurysms without the need for the remodeling technique (11), although there is no reason why the remodeling technique could not also be used with the aneurysm liner. It also tends to fix the delivery catheter at the aneurysm neck, after deployment of the first coil, resisting its displacement into the parent artery during subsequent coil insertion, a common problem during the placement of GDCs. Another possible advantage is that it may reduce the frequency of coil compaction and aneurysm recurrence by forming a smoother and more complete scaffolding across the neck of wide-necked aneurysms than can be achieved by using coils alone. This may allow for more complete closure of the neck, for effective ingrowth of fibroblasts on the surface of and through the mesh of the liner, thus sealing the neck, and for the eventual endothelialization of the resulting surface, as seen in the pig model. It is possible that the use of the liner will allow effective occlusion of aneurysms with a looser packing of coils. It is also likely, however, that by fixing the catheter it will allow tighter packing of coils, reducing the tendency of the coil mass to compress in large aneurysms. The aneurysm liner has potential disadvantages. It is relatively bulky, requiring, in prototype form, a 7F to 8F guide catheter for insertion. Technical refinements may improve on this. Although guidewire-directed, its navigability may be limited to relatively proximal aneurysms. It is thrombogenic, and thrombus formation was a problem during insertion in the in vivo experiment, in which anticoagulants were not used. It is likely that effective anticoagulation will minimize this problem, but heparin coating of the liner membrane is a possible refinement. The prototype liners were made of very thin knitted fabric. This made them susceptible to penetration by the first few millimeters of the first coil to be inserted. Generally, the liner contained the remainder of the coil. If only a small length of coil penetrates the liner, the situation is no worse with respect to the aneurysm than treatment with coils alone. Once the first coil has been inserted, the liner is distended, greatly reducing the likelihood of penetration by subsequent coils. When choosing the thickness and density of the liner material, there is a trade-off between the tendency of coils to penetrate its wall and the physical bulk of the device. Thinness is desirable to minimize the bulk of the device and increase its navigability but will increase the chance of coil penetration. Penetration may be minimized by reducing the radius of the first few turns of the first coil, as in the 2D GDC design (Target Therapeutics). The material has high tensile strength despite its thinness and is very much stronger than an aneurysm wall. The in vivo results can be criticized on the grounds that lateral wall venous pouch aneurysms in swine thrombose spontaneously (7). Testing in a less favorable model, such as the rabbit bifurcation aneurysm model (8), is desirable. Vascular access for a relatively bulky device, however, will be a problem. The device is an experimental prototype designed to establish the principle of lining an aneurysm with a strong porous membrane before filling it with coils. There is potential for refinements in its design, in the choice of materials, and possibly in the use of bioactive coatings for those materials. The porous, guidewire-directed, detachable aneurysm liner is a new weapon in the armory of endovascular aneurysm occlusion. Prototypes have been made and their behavior studied in preliminary in vitro and in vivo experiments. The main value of the liner is likely to be in the treatment of larger, wide-necked, proximal aneurysms, in which it may help to reduce the frequency of early and delayed aneurysm rupture. It may also help to retain coils inside the sac of wide-necked aneurysms without the need for the remodeling technique. It could aid effective packing of the aneurysm and facilitate healing of its neck with endothelialization. Use of the device could be extended to the occlusion of venous sinuses and to parent artery occlusion. Since submission of the original manuscript, several further prototype aneurysm liners have been made using a medical-grade knitted nylon material. Liners were successfully deployed in two venous-pouch bifurcation aneurysms in two dogs (15) and in one venous-pouch side-wall aneurysm in a pig. A dog bifurcation aneurysm measuring 24 mm in length and 11 mm in width was initially completely occluded using a 20-mm–diameter liner filled with two 30-cm GDCs (Fig 7). The liner then detached prematurely, precluding further packing. Angiography performed 30 days later showed that the underfilled liner and coils had compacted into the fundus of the aneurysm, allowing partial refilling of the aneurysm. The aneurysm was harvested on the 30th day. In a second dog bifurcation aneurysm, the liner detached prematurely during delivery of the second coil. This aneurysm was harvested 3 hours after insertion. The pig side-wall aneurysm was 12 mm in diameter and was well filled with a 13-mm liner and four GDCs. The aneurysm was harvested 3 hours after insertion. Failed attempts were made to navigate liners into two further side-wall aneurysms, one in a dog, the other in a pig. In the dog and pig specimens, harvested 3 hours after insertion, a thin, whitish, translucent film was observed on the surface of the liner material. This was adherent to the liner material and filled in the spaces between adjacent threads. Microscopy showed this film to be a fine layer of fibrin (Fig 8). It did not include a red cell component. In the dog specimen, harvested 30 days after insertion, there was extensive growth of fibrous tissue into the fundus of the aneurysm from the periphery (Fig 9). This penetrated the interstices of the liner material and surrounded the GDCs. Within the center of the liner there was a residuum of uninvaded blood clot. Within the fibrous ingrowth there was a mild chronic inflammatory reaction and some formation of multinucleate giant cells around the fibrils of the liner. Between the aneurysm liner and the luminal surface there was a thin layer of fibrous tissue. The luminal surface itself was smooth and showed no evidence of the formation of recent blood clot or attached thrombus. Microscopic appearance of the threads of an aneurysm liner, inserted into a pig aneurysm and harvested within 3 hours of insertion. 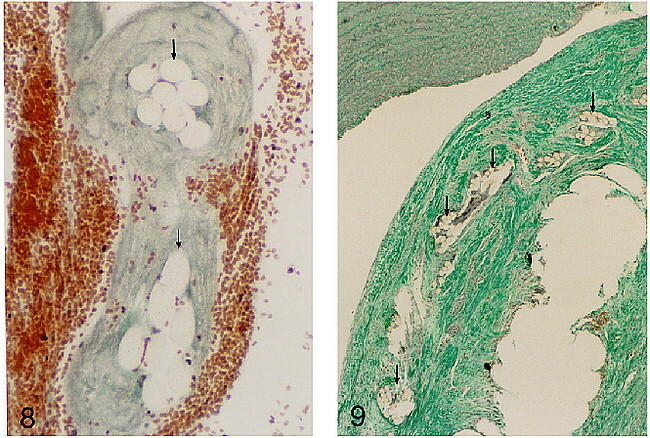 The threads (arrows) are surrounded by fibrin, which bridges the spaces between threads and probably forms a substrate for subsequent fibrosis (Masson trichrome, original magnification approximately ×400). fig 9. Microscopic appearance of the neck region of an aneurysm in a dog 30 days after insertion of an aneurysm liner and GDCs. The specimen was sectioned after removal of the GDCs and the resulting vacuole is in the right lower corner. Fibrous tissue surrounds the site of the coil. Sectioned threads of the liner material (arrows) are shown, overlain by a thin continuous layer of fibrous tissue, separating the liner from the luminal surface. There is a continuous layer of flattened cells lining the neck of the aneurysm. The parent arterial wall is seen at the top of this image (Masson trichrome, original magnification approximately ×90). We thank Joe Eder of Target Therapeutics and Mark Ellis and Mark Thorn of Boston Scientific UK for their help and encouragement, also for their gift of Tracker catheters, Stealth valve wires, and Tracker catheter marker rings, vital for construction of the prototypes. We thank Neal Hubbard for assistance with the in vivo experiment. We are also grateful to John Olney for helpful advice on the heat sealing of the liner material and for the procurement of an essential tool for this purpose. We thank Charles Strother and Al Rappe at the University of Wisconsin Department of Radiology and Gary Duckwiler and John Robert at the Leo Rigler Research Laboratory of the Department of Radiological Sciences, UCLA School of Medicine, for their help and advice and for the use of their facilities in the experiments described in the addendum. ↵1 M. A. Jeffree designed and made the aneurysm liners. The design is protected by patents held by M. A. Jeffree and by Target Therapeutics, Fremont, CA. 2 Address reprint requests to Dr. M. A. Jeffree, Department of Neuroradiology, King's College Hospital, Denmark Hill, London SE5 9RS, U.K.